I just spent the morning rereading Yudit Kiss’s The Summer My Father Died. Rereading it because I had already read it in the Hungarian original (Apám halálának nyara) a year ago. I couldn’t put it down then just as I couldn’t put it down this morning. I came to know Yudit Kiss who lives and works in Geneva not as a writer of fiction but as an economist and political commentator on Eastern Europe and naturally on Hungary. I received a link to one of her articles that appeared in The Guardian that I liked very much. As it turned out later, she knew about Hungarian Spectrum and through a mutual friend we got in touch with each other. It was at that time that I discovered she was also the author of a first novel that had garnered rave reviews. This morning I sat down to familiarize myself with the English translation of the book that was originally published in Hungarian in 2006 (Budapest: Noran). The literary merit of the book can be judged by the fact that it was the Hungarian-born Georges Szirtes, an English poet and recipient of the T.S. Eliot Prize, who agreed to translate it. The English publisher is Telegram. Although the title mentions only the summer when Yudit Kiss’s father died, the story through flashbacks covers about seventy years of turbulent Hungarian history. The story is gripping. Fülöp Holló, who dies during the sweltering summer of 1999, is a devoted communist who doesn’t seem to have any doubts about the “Cause.” Or if he does, he doesn’t share them with anyone. As it turns out, he is unwilling to face his own and his family’s past. Or, perhaps, he creates a past that never existed. He is especially uncomfortable with his own Jewishness, as if his adherence to communist ideology somehow swept away the Jewish past of his family. He creates his own version of his experience during the fateful days of 1944 which has little to do with reality. Eventually for the sake of the party he turns away from his mother, who subsequently joins relatives in Australia. Correspondence comes to an end and the son in Budapest never talks about her or his other relatives in Australia. Meanwhile he teaches Marxism-Leninism until, sometime after the change of regime, he is let go and has to pack up his beloved books and empty his office where he spent countless hours pondering the intricacies of communist thought. Outsiders, including his daughter, think that “he had completely missed out on his own life,” but at the end, just before his death, he wrote a farewell letter in which he claimed that he had not lived in vain. The death of the father is just one thread of the story and perhaps not even the most important one. 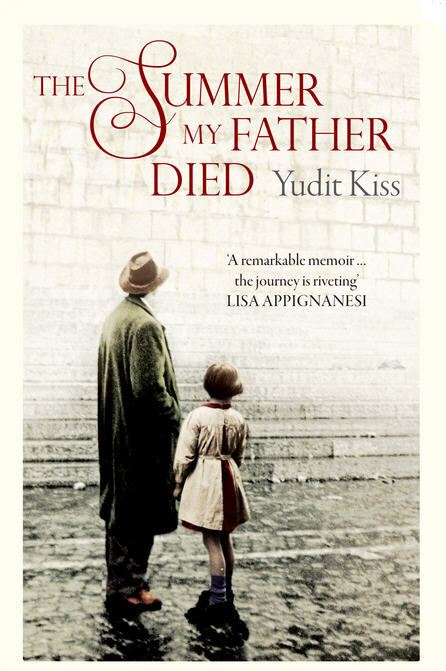 The Summer My Father Died is really the story of Yudit Kiss’s self-discovery. When she was growing up, her classmates told her that she was Jewish, but her father claimed that they were not because they were not religious. Yudit’s recognition of her own Jewishness occurred while she was visiting Cracow sometime in the 1970s. Wandering around in the Old City she stumbled on a synagogue that was closed but that she eventually managed to visit. There was also an exhibition of the deportation of the Jews of Cracow where she saw a picture “showing a middle-aged woman walking down the middle of the road by herself.” And suddenly she realized that this woman could have been her own grandmother or perhaps she herself. It was that afternoon that she decided that she was a Jew after all. But there is also the mother’s story that is out of the ordinary. Her maternal grandfather had “worked as coach-driver for the local landowner. He had a deep contempt for manual labour and avoided school at all costs.” The maternal grandmother was a servant in the house of the same landowner. When she became pregnant, the landowner made the coach-driver marry her. He was a drunken brute who beat her regularly. Rumor in the village had it that she might be the illegitimate child of a Jewish landowner, and indeed she did look different from her siblings. It was from this family that Yudit’s mother came. When as a sixteen-year-old the party sent her to school in Budapest, she was unable to tell time or eat with a knife and fork. Comrade Holló became her teacher and they eventually married. Mother also became a teacher. They lived modestly in a Budapest apartment stuffed with books for the rest of their lives together. The recurring theme of the book is captured in phrases that refer to the slow death of the father without any physical sign of illness. For example, “It may be that the summer my father died really started in the summer of 1956.” Or “My father’s death visibly began in the summer of 1992 at the outbreak of the first Yugoslavian war.” To my mind, Yudit Kiss here is saying that her father’s “Cause” was dying and with it he himself. Near the end of the book she asks: “Could my father have lived a different life? Could he have broken the ties that bound him to communism? Did he have any choice in the matter? [Jan Kott’s and Joseph Stiglitz’s] examples showed that early commitments are not necessarily lifelong. But what does it take to bring about such a radical conversion? Courage, honesty, accident, vanity?” And she adds: “One night it struck me that it wasn’t my father I was mourning, but the person he might have been. I thought he had failed to realise his true self, but that the possibility remained in him right to the moment he died. Under that badly cut commissar suit there was an old-fashioned humanist patiently waiting to emerge” (p. 221). The Summer My Father Died is such a rich book that no book review can ever do it justice. One must read it. Click, click … Wala. It’s on my Kindle. Where could potential reader in the US procure a copy in Hungarian? I’d love to read this in the original language. Thank you Eva, for reviewing this book. It sounds worth reading. I know IQ is not everything, but, well, its an example. It’s rather a destructive myth that history somehow OWES you something. There is another book published in Britain by Emylia Hall “The Book of Summers”. The author is from an English-Hungarian family (her mother is Hungarian). This book is a bit chic lit-y, the type that gets discussed by Richard and Judy’s book club, but very good as such. She also observes a lot of the heated temperament, how people get very familiar with each other very soon and in general, the differences between Hungarians and the English. She is very good at describing hot Hungarian summer holidays through the eyes of a girl otherwise growing up in Britain, but who still feels that she belongs to Hungary, too, and identifies a lot with the people. I heard a very good story from Z.L. a Jewish Hungarian or Hungarian Jew who became a communist in 1943 and who tried to reach the yougoslav partisans after the German occupation. He was cought and taken to Mauthausen concentration camp. He survived and after the war he became translator of Marx and Engels. In the early fifties when Jewish doctors were accused to have tried to kill Stalin, in his communist cell a barber who was before 1945 “kis nyilas” a simple member of the arrow cross party asked “can I trust my Jewish doctor”, to which the secretary of the cell replied, “of course, you are just a simple barber, nobody is interested to kill you”. Z.L. continued after 1957 to translate, but did not join again the communist party. As a story related to Jews, about Jews, this is the most irrelevant book. Totally reporting from the fringes and saying nothing about the real world of Hungary and Jews, even if she adds a suicide to the story. What is the source of the fascination? Let us go back to Hungary of 2012, and to the search for a reasonable 2nd, 3rd, 4th reform age. For the first you nearly managed to fool me – I assumed, that if you can write, you’re even able to read. I was wrong, – sorry about that! Thank you Eva, I was just looking for a new book for bedtime! Do you think it’s available in Hungarian in the US? For some reason I still don’t like to read literary prose in English. There is another book published in Britain by Emylia Hall “The Book of Summers”. Being a bloke, I’m not particularly keen on chick-lit but with all the rave reviews this book has been getting I feel tempted to buy it. The other one I’m not so sure about. An exploration of why someone’s father has led a mostly uneventful and thoroughly pointless life just doesn’t sound all that interesting to me. YMMV. Jano, the original of course is better but it seems to be out of print. Maybe now that the English is out Noran will reprint it. Sorry to barge in with a new topic. Hungarian Parliament modified the “Basic Law” an hour ago to make it constitutional to require voters to pre-register to be able to vote on elections or referendums. This way the Constitutional Court is not allowed to investigate whether the new election law is unconstitutional or not. Thanks very much! Amazon only goes so far for this sort of thing, and the Hungarian bookstores I knew of don’t ship this far. Much appreciated! For some reason there is no Hungarian e-book in sight, so you have to kill some tree anyhow. A small addition to the subject. I knew a few Jewish person with bourgeois background, who experienced – and survived – the hard times before- and during the war, who became communist afterwords. The answer to the ‘why’ is rather simple, however strange it looks from a distance: they’ve felt grateful and obliged on a strange way, and remained loyal, because these were the ideological opposite of the Nazis. It isn’t more complicated than this, as I see it. I’m not a psychiatrist, but I guess it has a lot to do with the experience of the total abandonment and betrayal of their previous society, and they really felt liberated by the end of the war. As I learned personally, they really wanted to give back something – and that was the way then. I guess, there is no black-or-white answers regarding the recent Hungarian history, there never is, even if we looking back further. Thank you for the book, Eva, good to get away from the actual-political mud-stomping for a change! I disagree with you. The ideological view is that the issue is a circle, at one point is the ideal democracy at the opposite point on the circle is nazism and communism…from there you can wander up on either side of circle toward the optimum condition. Nazism never was and is not now the opposite of communism, they are a variant of the same mental abberration. Jewish religion has had Communistic ideas since the time of writing the Deuteronium at the latest. Correction: Deuteronomy = Deutero-nomion was written about 2,700 years ago. – I agree with the ‘are’, however your reasoning regarding the ‘were’ is faulty. Remember, we’re talking about – I did – postwar times, when the communist – Soviets in principle – actually liberated the ghettos and concentration camps – at least in the Eastern part of the continent – so your reasoning definitely need some more time to kick in. I also try to call your attention to the fact, that WWII wasn’t a clash of ideologies, the ideologies only fueled Nazi side from the start. I also would like to point at the fact, that my post above dealing with a possible explanation of a seemingly unreasonable loyalty, based on my own experience and way off from ideological comparison, which is nothing more than gnawing on the old bone time and again, in my opinion anyway. Spend some moment, Louis and try to think about it. Here we disagree again. while a movie is not the most accurate depiction of history (you can dig deeper if you like), but I strongly recommend, for a start, for you to view the Soviet Story. There we go again… typical, they just modify the new constitution so that the Constitutional Court cannot investigate the planned voter registration process. A clear abuse of the 2/3 majority again, to rewrite the constitution to avoid democratic control over their legislation. All you Orban defenders, please explain it to me why this is not an abuse of democratic principles. He lived two doors away in my childhood. I see that, but then again you talking about entirely different things. The people who were forced to endure the everyday mental and physical atrocities based on Nazi ideology, even torture and death camps due to racial, political or religious grounds indeed welcomed the communist liberators, whatever you say. From here isn’t that hard to take that mental leap, if you think about it. Yes, the notes at the end of the book with references to page numbers are excellent. I was also glad to see a list of English translations of Hungarian literary works. Thanks Tyrker – maybe it was a bit pretentious of me to call it “chic lit”-y, I’m sure you will enjoy it. It was recommended to me by an English friend, to whom it was an eye-opener – “oh, THAT’ S why Hungarians are like that, THAT’S why they do that” etc. I don’t have a Kindle, but I have a tablet with Android on it and a credit card. Can I get the book from Amazon? Check out Barnes and Noble Nook Books…it’s free software, and they have a great catalogue. On a slightly related note – I was fascinated to see that the film version of Az Ajtó, which was filmed in English, was showing in Hungary in the summer dubbed into Hungarian! The book is a good read, by the way, the English translation is excellent. But it is one of the most disturbing things I’ve ever read – it haunts me still. We were talking about the equality of communist and nazi cruelties toward people. I am sure that someone in a Nazi concentration camp was happy that the Russians freed them as well as that there were people in the Baltic republics and in the Ukrain who were happy when the Germans came. Being freed by the Russians certainly justified cooperating with the new (at that time non-communist) Hungarian government, but not the participation in the communist party’s AVO/AVH. I still state that a good anti-nazi (if honest) will be a good anti-communist also. I am not expecting that the survivors (very few) or relatives of the Poles massacred at Kathyn to turn nazi or Gestapo agents either……. Also the world does not rotate around Hungary, you cannot view history only from Hungarian standpoint. Eva, thanks for the tip. I read the book and liked it a lot. It will be my Xmas present to my wife, hoping to help her understanding my background, that is similar yet different from the authors. But the door may crack a bit open for my wife to peek in and continue to learn more about the mysteries of Hungary.